In 221 B.C., Ying Zheng, ruler of the State of Qin and a man of great talent and bold vision, ended the 250-odd years of rivalry among the independent principalities during the Warring States Period, establishing the first centralized, unified, multi-ethnic feudal state in Chinese history—the Qin Dynasty (221-207 B.C.). He called himself Qin Shi Huang or "First Emperor of Qin." He standardized the written script, weights and measures, and currencies, and established the system of prefectures and counties. The sovereigns of the next 2,000-odd years followed the feudal governmental structure established by him. He mobilized more than 300,000 people over a period of a dozen years to build the Great Wall, which stretches for 5,000 km in northern China. Qin Shi Huang had work on his enormous mausoleum started early in his reign. 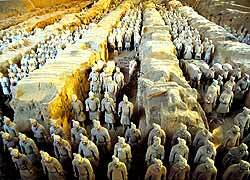 The terracotta warriors of the "underground army" guarding the mausoleum, unearthed in 1974, amazed the world. The 8,000 vivid, life-size pottery figures, horses and chariots have been called the "eighth wonder of the world."